"5th of May" redirects here. For the date, see May 5. Cinco de Mayo (pronounced [ˈsiŋko ðe ˈmaʝo] in Latin America, Spanish for "Fifth of May") is an annual celebration held on May 5. The date is observed to commemorate the Mexican Army's victory over the French Empire at the Battle of Puebla, on May 5, 1862, under the leadership of General Ignacio Zaragoza. Cinco de Mayo is sometimes mistaken for Mexico's Independence Day—the most important national holiday in Mexico—which is celebrated on September 16, commemorating the Cry of Dolores that initiated the war of Mexican independence from Spain. Late in 1861, a well-armed French fleet attacked Veracruz, landing a large French force and driving President Juárez and his government into retreat. Moving on from Veracruz towards Mexico City, the French army encountered heavy resistance from the Mexicans close to Puebla, at the Mexican forts of Loreto and Guadalupe. The French army of 8,000 [note 1] attacked the poorly equipped Mexican army of 4,000. [note 2] On May 5, 1862, the Mexicans decisively defeated the French army. The victory represented a significant morale boost to the Mexican army and the Mexican people at large and helped establish a sense of national unity and patriotism. The Mexican victory, however, was short-lived. A year later, with 30,000 troops, the French were able to defeat the Mexican army, capture Mexico City, and install Emperor Maximilian I as ruler of Mexico. The French victory was itself short-lived, lasting only three years, from 1864 to 1867. By 1865, "with the American Civil War now over, the U.S. began to provide more political and military assistance to Mexico to expel the French". Upon the conclusion of the American Civil War, Napoleon III, facing a persistent Mexican guerilla resistance, the threat of war with Prussia, and "the prospect of a serious scrap with the United States", retreated from Mexico starting in 1866. The Mexicans recaptured Mexico City, and Maximilian I was apprehended and executed, along with his Mexican generals Miguel Miramón and Tomás Mejía Camacho in Cerro de las Campanas, Querétaro. "On June 5, 1867, Benito Juárez finally entered Mexico City where he installed a new government and reorganized his administration." The Battle of Puebla was significant, both nationally and internationally, for several reasons. First, although considerably outnumbered, the Mexicans defeated a much-better-equipped French army. "This battle was significant in that the 4,000 Mexican soldiers were greatly outnumbered by the well-equipped French army of 8,000 that had not been defeated for almost 50 years. "[note 3] Second, since the Battle of Puebla, some have argued that no country in the Americas has subsequently been invaded by any other European military force. [note 4] Historian Justo Sierra has written in his Political Evolution of the Mexican People that, had Mexico not defeated the French in Puebla on May 5, 1862, France would have gone to the aid of the Confederacy in the U.S. Civil War and the United States' destiny would have been different. According to a paper published by the UCLA Center for the Study of Latino Health and Culture about the origin of the observance of Cinco de Mayo in the United States, the modern American focus on that day first started in California in 1863 in response to the resistance to French rule in Mexico. "Far up in the gold country town of Columbia (now Columbia State Park) Mexican miners were so overjoyed at the news that they spontaneously fired off rifle shots and fireworks, sang patriotic songs and made impromptu speeches." On June 7, 2005, the United States Congress issued a concurrent resolution calling on the President of the United States to issue a proclamation calling upon the people of the United States to observe Cinco de Mayo with appropriate ceremonies and activities. To celebrate, many display Cinco de Mayo banners while school districts hold special events to educate students about its historical significance. 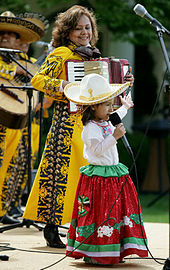 Special events and celebrations highlight Mexican culture, especially in its music and regional dancing. Examples include baile folklórico and mariachi demonstrations held annually at the Plaza del Pueblo de Los Ángeles, near Olvera Street. Commercial interests in the United States have capitalized on the celebration, advertising Mexican products and services, with an emphasis on alcoholic beverages, foods, and music. According to Nielsen, in 2013 more than $600 million worth of beer was purchased in the United States for Cinco de Mayo, more than for the Super Bowl or St. Patrick’s Day. The former Forts of Guadalupe and Loreto now house a museum. In Puebla, historical reenactments, parades, and meals take place to commemorate the battle. Parade participants dress as French and Mexican soldiers to reenact the battle. Every year the city also hosts the Festival Internacional de Puebla, which gathers national and international artists, traditional musicians and dancers. As well as the Festival Internacional del Mole, with an emphasis on the city's iconic mole poblano. In Mexico City, military commemoration is occasionally held at the Campo Marte. A street, Avenida Cinco de Mayo, in the Historic Center of Mexico City was named after the battle in 1862 by Benito Juárez. Events tied to Cinco de Mayo also occur outside Mexico and the United States. As in the United States, celebrations elsewhere also emphasize Mexican cuisine, culture and music. For example, some Canadian pubs play Mexican music and serve Mexican food and drink, and a sky-diving club near Vancouver holds a Cinco de Mayo skydiving event. In the Cayman Islands, in the Caribbean, there is an annual Cinco de Mayo air guitar competition, and at Montego Bay, Jamaica, there is a Cinco de Mayo celebration. The city of Brisbane, Queensland, Australia, holds an annual Mexican Festival to honor the day, and celebrations are held in London and New Zealand. Other celebrations of the day can also be found in Cape Town, South Africa, Lagos, Nigeria, and in Paris. Cinco de Mayo is celebrated in Japan in Osaka and in Tokyo's Yoyogi Park Event Space as a celebration of Latin American culture. ^ According to Mexico's National Institute of Historical Studies on the Mexican Revolution the Mexican force consisted of 4,802 soldiers. Archived October 6, 2012, at the Wayback Machine And Peter Hicks of the French Fondation Napoléon and other French sources state the size of the Mexican force was 12,000 men. . Hayes-Batista clarifies on page 60 of his El Cinco de Mayo: An American Tradition that after the smaller Mexican force had defeated the French on May 5, they received reinforcements on May 6 and 7 of approximately 12,000 additional Mexican soldiers. ^ It has been pointed out that, contrary to reports on PBS and in Philadelphia's The Bulletin, the French were in fact considered to have been defeated by the Russians at the Siege of Petropavlovsk in 1854. ^ The statement in The Bulletin is, "This was the last time any army from another continent invaded the Americas." Note it says "invaded", and not "attacked." Thus, since Cinco de Mayo no army from another continent has invaded the Americas. The War of the Falklands War, for example, was fought in the Americas but the Islands were invaded by a military from the Americas (the Argentine military). They were subsequently attacked (not invaded) by the UK. Another example, Pearl Harbor, experienced an attack, not an invasion by the Japanese. The only possible exception to the Cinco de Mayo claim above might be the brief occupation/invasion of two of the Alaskan Aleutian Islands by the Japanese military during WWII. This event, however, was so insignificant as to be virtually negligible: the islands invaded had a total population of 12 Americans and some 45 natives, the invasion was short-lived, and the battle fought there had no notoriety other than the psychological effect on the Americans that the Japanese had invaded American territory again (Alaska was not yet a full-fledged state). In short, the military importance of these small pieces of land was nowhere comparable to the superior military significance of the Battle of Puebla. ^ a b Lovgren, Stefan (May 5, 2006). "Cinco de Mayo, From Mexican Fiesta to Popular U.S. Holiday". National Geographic News. ^ "RECOGNIZING THE SIGNIFICANCE OF CINCO DE MAYO". Congress.gov. House of Representatives. May 4, 2009. Retrieved May 1, 2017. ^ a b "Cinco de Mayo". University of California at Los Angeles. Archived from the original on April 8, 2006. Retrieved May 5, 2011. ^ "Cinco de Mayo celebrations run all weekend". Deseret News. Retrieved May 8, 2007. ^ "Cinco de Mayo has become a day for celebrating Mexican culture in the United States, and celebrations there easily outshine those in Mexico". About.com. Retrieved May 8, 2007. ^ "Why is Cinco de Mayo More Popular in America Than in Mexico?". US News & World Report. Retrieved 5 May 2018. ^ Lauren Effron (May 5, 2010). "Cinco de Mayo: NOT Mexico's Independence Day". Discovery Channel. Retrieved May 5, 2011. ^ Minster, Christopher (December 16, 2013). "Cinco De Mayo/The Battle of Puebla". About.com. Retrieved April 25, 2016. ^ a b c Herz, May. "Cinco de Mayo". Inside Mexico. Retrieved May 5, 2011. ^ "Cinco de Mayo". History.com. Retrieved May 5, 2011. ^ "Cinco de Mayo". Mexico Online. April 25, 2007. Retrieved May 5, 2011. ^ "Cinco de Mayo: What's all the fuss about?" Julia Goralka. The Washington Times. May 2, 2012. Retrieved November 15, 2012. ^ Happy Cinco de Mayo – Sorta. Ray Suarez. PBS News Hour. May 4, 2012. Retrieved October 28, 2012. ^ Cinco de Mayo. Mexico Online: The Oldest and most trusted online guide to Mexico. Retrieved November 13, 2012. ^ Cinco de Mayo. 2011. The History Channel website. Retrieved May 5, 2011. ^ The Significance of "Cinco de Mayo". Ignacio González. 1996. Retrieved November 15, 2012. ^ Cinco de Mayo -The Backstory. Archived May 13, 2013, at the Wayback Machine Tony Azios. 'Llero. Jaws Communications. 2010. Retrieved November 15, 2012. ^ Cheryl VanBuskirk (May 7, 2009). "Cinco De Mayo: Join In The Celebration On The Fifth Of May". The Bulletin: Philadelphia's Family Newspaper. Archived from the original on May 11, 2009. Retrieved May 10, 2010. ^ History Channel.com. Retrieved May 14, 2010. ^ a b Happy Cinco de Mayo: Top 10 Drunkest Holidays.. Time. By Frances Romero. Wednesday, May. 05, 2010.. Retrieved May 14, 2010. ^ a b c d "Cinco de Mayo". Mexico Online: The Oldest and most trusted online guide to Mexico. ^ Michael C. Meyer; William H. Beezley (2000). The Oxford History of Mexico. Oxford University Press. pp. 387–8. ^ a b Cinco De Mayo: Join In The Celebration On The Fifth Of May. Archived May 11, 2009, at the Wayback Machine Cheryl VanBuskirk. The Bulletin: Philadelphia's Family Newspaper. Philadelphia, Pennsylvania, US. May 7, 2009. Retrieved June 5, 2009. ^ The Battle of Puebla and Cinco de Mayo. PBS. Retrieved February 6, 2009. ^ Cinco De Mayo: Join In The Celebration On The Fifth Of May. Archived May 11, 2009, at the Wayback Machine Cheryl VanBuskirk. The Bulletin: Philadelphia's Family Newspaper, May 7, 2009. Retrieved June 5, 2009. ^ "Mexico's Lasting European Influence. By Jose Antonio Burciaga. Free Lance-Star Publishing. May, 2007. (First released in The Hispanic News Link. 1981.)". Banderasnews.com. Retrieved May 5, 2011. ^ Robert L. Bidwell (Apr 1971). "The Political Evolution of the Mexican People. By Justo Sierra. Translated by Charles Ramsdell. Austin, TX: The University of Texas Press. 1969". Journal of Interamerican Studies and World Affairs. Center for Latin American Studies at the University of Miami. 13 (2): 306–308. JSTOR 174689. ^ a b Southern California Quarterly "Cinco de Mayo's First Seventy-Five Years in Alta California: From Spontaneous Behavior to Sedimented Memory, 1862 to 1937" Spring 2007 (see American observation of Cinco de Mayo started in California) Retrieved October 30, 2007. ^ Hayes-Bautista, David E. (April 2009). "Cinco de Mayo: The Real Story". EGP News. Eastern Group Publications. Retrieved June 2, 2016. Far up in the gold country town of Columbia (now Columbia State Park) Mexican miners were so overjoyed at the news that they spontaneously fired off rifles shots and fireworks, sang patriotic songs and made impromptu speeches. ^ Cinco de Mayo minor holiday in Mexico. UPI. World News. May 5, 2010. Retrieved May 15, 2010. Verified March 20, 2013. ^ Cesares, Oscar (May 5, 2010). "Holiday of Cinco de Mayo is minor event in Mexico". Houston Chronicle. Retrieved May 15, 2010. ^ "Cinco de Mayo". History.com. Retrieved March 10, 2013. ^ Lovgren, Stefan. "Cinco de Mayo History: From Bloodshed to Beer Fest". National Geographic. Los Angeles. Retrieved May 5, 2011. ^ Canalis, John (April 26, 1992). L.A. hosts nation's biggest Cinco de Mayo party. UPI Archives. Retrieved August 22, 2016. ^ Jamison, Peter (April 24, 2016). With thinner crowds in a smaller space, Fiesta Broadway feels deeply diminished. Los Angeles Times. Retrieved August 22, 2016. ^ Library of Congress (U.S.A.) Declaration. Retrieved February 6, 2009. ^ "Constellation Brands and Crown Imports Ring in Cinco de Mayo at New York Stock Exchange". ACNNewswire.com. Victor, New York: Asian Corporate News Network. May 3, 2012. Retrieved May 8, 2012. ^ "What Is Cinco de Mayo?". The New York Times. 5 May 2018. Retrieved 6 May 2018. ^ Did You Know? Cinco de Mayo is more widely celebrated in USA than Mexico. Tony Burton. Mexconnect. Retrieved May 8, 2013. ^ Cultural adaptation: the Cinco de Mayo holiday is far more widely celebrated in the USA than in Mexico. Geo-Mexico. May 2, 2011. Retrieved May 8, 2013. ^ 25 Latino Craft Projects: Celebrating Culture in Your Library. Ana Elba Pabon. Diana Borrego. 2003. American Library Association. Page 14. Retrieved May 8, 2013. ^ 7 Things You May Not Know About Cinco de Mayo. Jesse Greenspan. May 3, 2012. Retrieved May 8, 2013. ^ Congressional Record – House. Page 7488. 9 May 2001. Retrieved May 8, 2013. Note that contrary to most other sources, this source states the date Juarez declared Cinco de Mayo to be a national holiday was September 8, 1862. ^ Holidays 2013. Archived May 13, 2013, at the Wayback Machine U.S. Consulate in Mexico. Retrieved April 16, 2013. ^ Los días de 2013 que, por ley, debes descansar. January 9, 2013. Retrieved April 16, 2013. ^ Calendario Escolar 2012–2013. Archived April 13, 2013, at the Wayback Machine Secretaria de Educacion Publica. Government of Mexico. Retrieved April 16, 2013. ^ Calendario Puebla 2012.. Retrieved April 16, 2013. ^ Circular 0077-13 Calendario Oficial de Días Festivos 2013. [permanent dead link] Adelante. Gobierno del Estado de Veracruz. January 16, 2013. Retrieved April 16, 2013. ^ a b c "How people actually celebrate Cinco de Mayo in Mexico". Business Insider. Retrieved May 3, 2017. ^ "Peña Nieto no estará en Puebla para desfile del 5 de Mayo; conmemora Batalla en Campo Marte". SDPnoticias.com (in Spanish). May 5, 2015. ^ Canadian celebration Archived August 27, 2012, at the Wayback Machine; St. Albert, Canada 2012 celebration Archived June 22, 2012, at the Wayback Machine; Montreal celebration[dead link]. Retrieved May 8, 2012. ^ "Cinco de Mayo Skydiving Boogie 2008". Abbotsford, British Columbia, Canada. Archived from the original on April 19, 2008. Retrieved May 5, 2008. ^ Cayman Cinco de Mayo air guitar Archived January 16, 2015, at the Wayback Machine. Retrieved May 5, 2008. ^ Jamaica celebration Archived July 18, 2012, at the Wayback Machine. Retrieved May 8, 2012. ^ "Where to Celebrate Cinco de Mayo in London". Retrieved May 8, 2012. ^ Mexican Ambassador to New Zealand honors Cinco de Mayo. Retrieved May 8, 2012. ^ "El cinco de mayo – Paris – jeudi 05 mai" After Work. Retrieved May 8, 2012. ^ "Cinco De Mayo Festival in Tokyo" Archived February 22, 2014, at the Wayback Machine JapanBases.com. Retrieved August 16, 2013. ^ "Cinco de Mayo 2013: Celebrating the Americas" Cinco de Mayo Festival. Retrieved August 16, 2013.